Sheep Robbery 200 Dollars Reward [re sheep stolen from Edward Abbott, Junior, near Russell’s Falls] Dated Jan, 9, 1826. Foolscap folio broadside. Ferguson 1052b. Description based on a photographic copy in TAHO, but Ferguson did not know the whereabouts of the original. Unable to locate the photographic copy either as at 31 Dec. 2016. 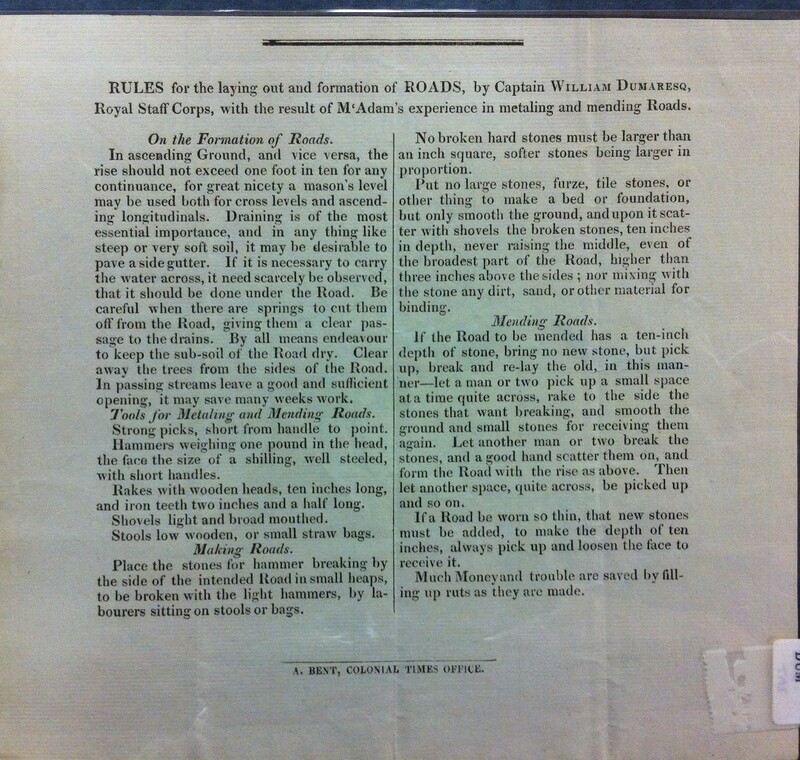 Rules for the Laying Out and Formation of Roads, by Captain William Dumaresq, Royal Staff Corps, with the Result of M’Adam’s Experience in Metaling and Mending Roads. A. Bent, Colonial Times Office. 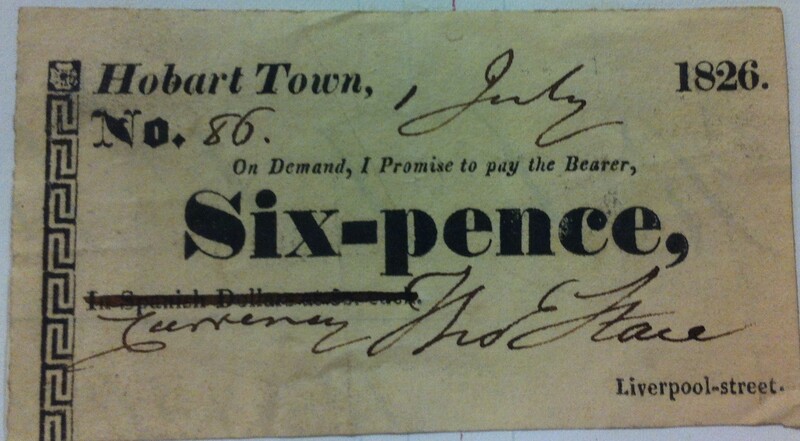 No date but probably 1826. Broadside, 20.8 x 22.5 cm. W. J. Dumaresq, in Sydney, sent the document from which this item was printed as an enclosure in a letter to his brother Edward in Hobart, dated 22 Dec 1825. This item would appear to be only the lower half of a larger sheet. 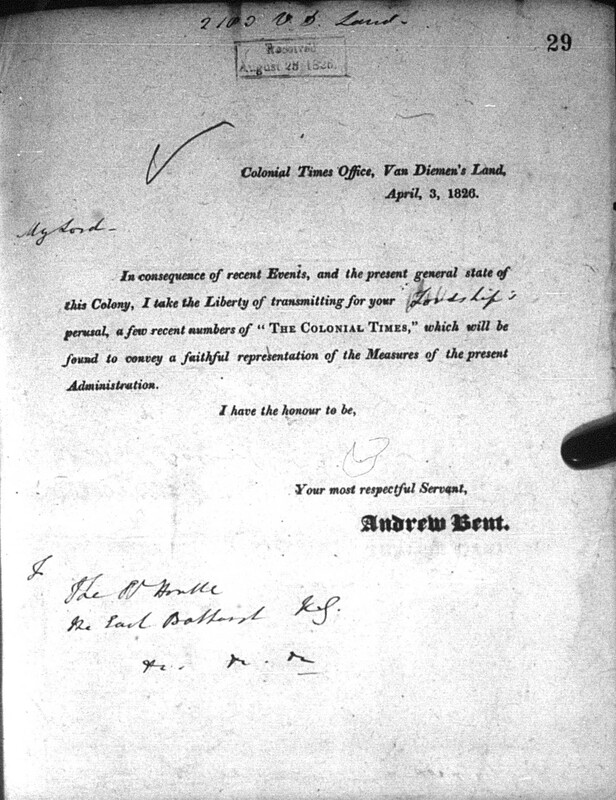 [Proclamation by His Excellency Colonel George Arthur re Matthew Brady and other bushrangers] 1 March 1826. Printed by A. Bent, Colonial Times Office. Arthur enclosed a copy in Despatch no. 14, 11 Apr. 1826. (CO280/5 f. 238). The use of large black type for the imprint was quite deliberate. Bent took advantage of an irresistible opportunity to make a point. In 1825-6 bush ranging was once more running rampant and Arthur blamed the unsettling effects of a licentious opposition press. The Executive Council was much preoccupied with both issues at its meetings in February and March 1826. 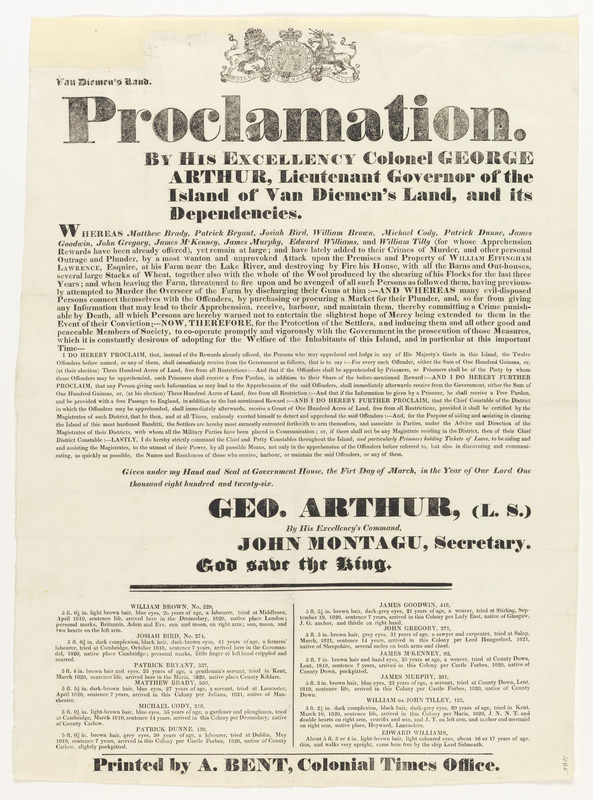 The proclamation was dated 1 March, but over a week later the copies intended for distribution throughout the island had still not been printed. On Friday 10 March (ironically the day after Chief Police Magistrate Humphrey had, as a member of the Executive Council, discussed the ‘baneful influence’ of the Colonial Times and the need to impose restrictions on the press forthwith) he had to go cap in hand to Bent to ask him if he could possibly print 500 copies of the proclamation in time to be sent in that evening’s post. Bent and his men were busy all day getting out the newspaper but he kept his workmen back until midnight and got the job done. In the CT of 19 March Bent described what had happened and how it showed he was not unwilling, as had been suggested, to help the Government in times of emergency, and it would not hurt them to provide him with the Government Notices for his paper, as he had repeatedly asked. He returned to this theme on 28 April, by which time he had been finally sentenced for libels and was cooling his heels in jail. When the Proclamation for the bush-rangers was wanted at a moment of urgency, our Press was resorted to, and we, forgetful of the pitiful treatment we have experienced in the withholding from us the Public Notices (a solitary instance of narrow-mindedness in the whole world), and mindful only of the public good, that we instantly quitted all other occupations, and produced it in a few hours! And that at this very time we are printing the Runaway List for the Government! Copy seen is addressed (in Bent’s hand) to Lord Bathurst. As the letter was printed so as to have the addressee’s name inserted by hand, there were probably other recipients (TNA CO280/9 f. 29). The newspapers transmitted are not on the file, but a faint image on the next folio indicates that they included the highly damaging (for the local government) issue of 7 Apr. 1826. 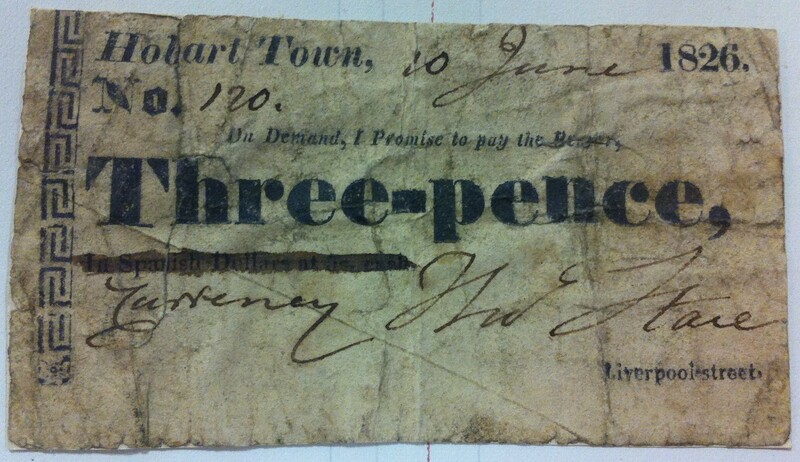 [Currency Conversion Table] Advertised in CT 17 Nov. 1826. “A TABLE, by which Sterling Money of any number of Spanish Dollars, from 1 to 1000, may be seen at one view at the rate of 4s. 4d. each, to be had at the Times Office. Price, 6d.” No copies. Announced as just published in CT 24 Nov. 1826. Price 1 shilling on delivery. Several thousand letter-press printed promissory notes of one pound sterling each, have been ‘struck off’ during the week at our office. They are neatly executed, with an elegant new type-the sum very large, in old English black. We will undertake to say, that this form cannot be forged, as the type is not to be obtained by any other person except Mr. BENT. Other most effectual measures have also been adopted to prevent forgery. A Copy may be seen at the Office.